In that post, I explained that my extended family has always claimed Little Grandma lived to be 105 years old, which would indicate she was born in 1858. But after reviewing the records generated throughout her life that provide an age, I concluded that the best evidence indicates that Aurelia was actually born in 1864, the year of her baptism. Maria Aurelia Compean Sanches (using the traditional Mexican naming convention) was baptized on 10 January 1864 at the age of 10 days old. This would make her date of birth 01 January 1864, and would mean she lived to be 99 years old at the time of her death on 17 February 1963, not 105 years old as my extended family has thought for most of our lives. Baptism transcription index card. Ancestry.com. Mexico, Select Baptisms, 1560-1950 [database on-line]. Provo, UT, USA: Ancestry.com Operations, Inc., 2014. Aurelia’s baptism record is the record, among those I have identified so far, most contemporaneously created at the time closest to her actual birth. 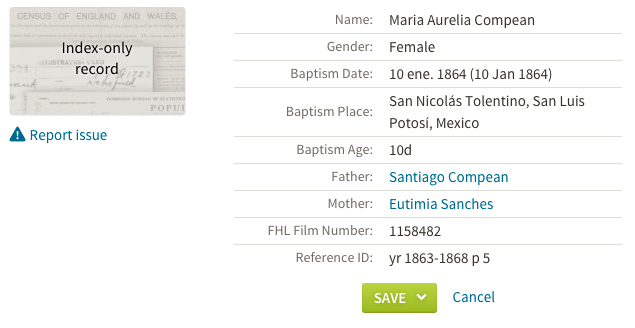 But the only record I had for her baptism is a translated transcribed index entry (shown above) in Ancestry and FamilySearch, which leaves at least a couple opportunities for human error. As stated in my last post, I needed to find a copy of her original Spanish-language full baptism record. But those records are not yet fully indexed and searchable on FamilySearch, meaning I would have to browse image-by-image in the collection — something I had not set aside time for just yet. Within one hour of my last blog post going live, my genealogy buddy Cathy Meder-Dempsey kindly found and messaged me a link to Aurelia’s digitized baptism record. Baptism record for Maria Aurelia Compean, 10 January 1864. “México, San Luis Potosí, registros parroquiales, 1586-1970,” images, FamilySearch (https://familysearch.org/pal:/MM9.3.1/TH-1942-20441-15039-36?cc=1860864&wc=MC4Z-4WL:167671401,167671402,167737601 : accessed 5 May 2015), San Nicolás Tolentino > San Nicolás Tolentino > Bautismos 1863-1880 > image 13 of 921; parroquias Católicas, San Luis Potosi (Catholic Church parishes, San Luis Potosi). 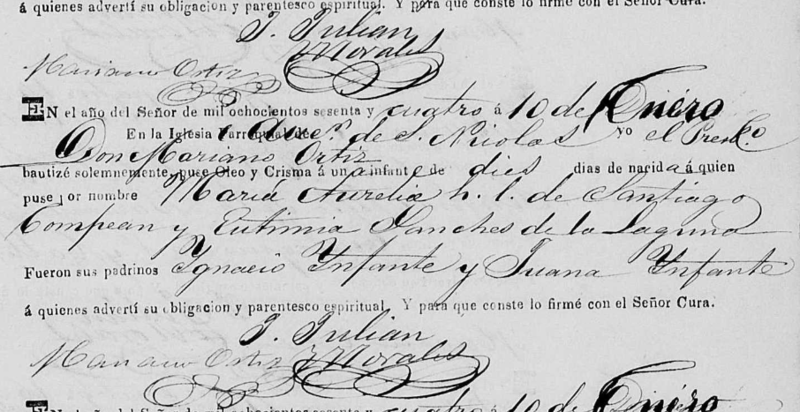 The digitized copy of Aurelia’s original Spanish-language baptism record confirms that she was baptized on 10 January 1864 at the age of 10 days old — making her date of birth 01 January 1864. There are no translation or transcription errors in that English index entry. Pretty strong proof to refute my extended family’s longtime claim that Little Grandma was born in 1858 and lived to be 105 years old (claims made on her death record and in her obituary). But, as stated in my last blog post, I had more record types to review in this attempt to verify Aurelia’s birth year. Declaration of intent for Aurelia Compean to marry Refugio Nieto. From the full record of marriage. FamilySearch.”México, San Luis Potosí, registros parroquiales, 1586-1970,” images, FamilySearch (https://familysearch.org/pal:/MM9.3.1/TH-1951-20440-23372-37?cc=1860864&wc=MC48-NZS:167672101,167668102,168345101 : accessed 6 May 2015), Villa Hidalgo > San José > Información matrimonial 1880-1886 > image 491 of 755; parroquias Católicas, San Luis Potosi (Catholic Church parishes, San Luis Potosi). Maria Aurelia Compean married Refugio Nieto (1863-1909) on 18 October 1883 in the Villa de Yturbide (now Villa de Hidalgo), a municipality in the state of San Luis Potosi, Mexico. Aurelia’s section of the prerequisite declaration of intent to marry (dated 20 September 1883) notes that she was 18 years old at the time. The age on this marriage record is still off. If Aurelia was 18 years old in October of 1883, her birth year would calculate out to 1865 (since she was born in the month of January). Yet she was baptized in 1864. She had to have been 19 years old at the time of her marriage, since one cannot be born AFTER being baptized. My hope had been that finding Aurelia’s marriage record would substantiate the birth year implied in her baptism record, or at the very least would substantiate one of the other conflicting birth years — not offer forth yet ANOTHER birth year possibility. However, since (as stated above), Aurelia could not have been baptized prior to being born, the 1864 birth year provided on her baptism record still seems the most likely candidate. The baptism record remains the most contemporaneously created record for the time of her actual birth. And since the church wrote these baptism entries in chronological order in a log book, it’s not like the hand-written entry for Aurelia got mistakenly filed in the wrong year — the baptism entries immediately before and after hers are for the same date, with those three January 10th 1864 baptisms sandwiched between records for January 9th and 11th. 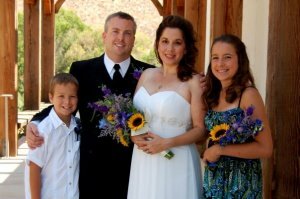 Obtaining copies of the actual baptism and marriage records does at least allow me to check off two of the four “next steps” I identified in my last post. I need to also try to find civil registration records for Aurelia’s birth and marriage. And a discussion with my father this past weekend raised another record source to investigate as well — a church confirmation record. Until then, I’m still leaving Aurelia’s birth year noted as 1858 in my database, research log, family tree, and Snapshot Box below. I will also have to change the birth year built into the custom URL I use to pull together all posts in this blog pertaining to Aurelia, which means writing a permanent URL redirect so people don’t land on a broken link — hence, the wait until more hopeful birth year confirmation. Thank you Colleen for the mention. It was only a little payback for the help you gave us by sharing how you do your Snapshot Box.